Couples in The Liberties are transforming the perception of lesbian and gay relationships nationwide. According to a new report by GLEN, Dublin 8 holds the highest share of civil partnerships with 60 married lesbian or gay couples in the area. These 60 couples join a total of 862 civilly partnered couples registered between April 2011 and September 2012 across Ireland. That’s an average of two civil partnerships a day. 61 per cent of these were gay and 39 per cent lesbian. The partners came from Ireland and 60 other countries including the UK, Brazil, Australia, the Philippines, Poland and the US. Many more civil partnerships were registered abroad too and automatically recognized in Ireland. Civil partnerships can take place in either a Civil Registration office or an approved external venue. The most popular location for ceremonies was Dublin 2 – the location of the main Dublin Civil Registration ceremony office. Cork City was the next most popular location. In Europe, 1,724 LGB men and women united from 61 countries in civil partnerships in the year. Ireland took up almost half of this and all of its counties had ceremonies. 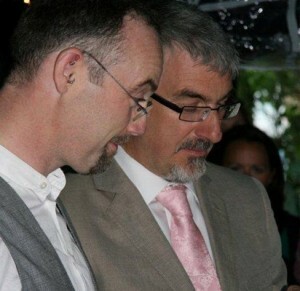 Many gay and lesbian couples have waited patiently for decades to get their relationships formally recognized by the Irish state. Mr. Wedge, who has been with his partner for 20 years says he was “glad to have achieved this recognition”, but when asked if he would marry his husband if equal marriage were established he said he’d “definitely have the civil partnership upgraded”. As a result of having to wait so long for civil partnership, LGB couples are tying the knot much later than their straight counterparts. Over 1,000 of those taking part in civil partnerships were aged between 31 and 50. Fourteen of the individuals were aged over 70 and only 11 were aged between 18 and 20. Under the civil partnership act, partners have the same rights and obligations as married couples in areas of tax, inheritance, next of kin, social welfare, immigration and pensions. That said, there are large areas left out of this legislation in Ireland, especially in the area of family life. Children can only be adopted by gay people singly. Where this brings danger to children is if the ‘adoptive parent’ dies and the other parent is instantly cut off legally. Moreover, the child himself or herself has no connection with the surviving parent and is cast adrift. A hope is that if more civil partnerships become registered in Ireland, the Irish Government will become aware of the unique needs of lesbian and gay couples and the adoption legislation may be reviewed.